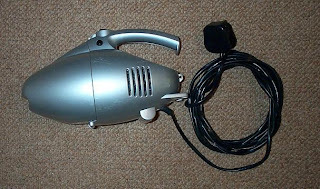 The 600 Watt vacuum cleaner that started it all. It's made in China, where they obviously haven't yet perfected the technique of making poor quality goods that hold together just long enough for you to lose the guarantee. It's so powerful, it nearly twists your wrist off when you start it. And instead of the usual plastic moulding, it boasts a lightweight aluminium compressor wheel of superb design and construction. I put a strobe light on the spinning compressor and found it was rotating at 50,000rpm! On sale new for about £20 - I got it for £3 from a car-boot sale. The diffuser vane assembly, which stops the air spinning after it is ejected from the compressor wheel. This is plastic so it won't stand the temperatures - pity. 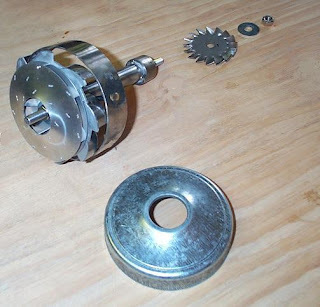 The compressor wheel proper - beautifully made from light gauge aluminium sheet. Bottom left, the new diffuser. Made from 1.8mm aluminium sheet with vanes cut from a bit of shim steel and glued in place with epoxy. It's a push-fit inside the housing and the springy vanes hold it nicely in place. and direct it back to the centre while taking out the spin. The result should be a smooth flow of compressed air. Notice there's one more diffuser vane than there are blades in the compressor? That is a refinement that further reduces turbulence. If they matched up, the result would be a siren. Top row, the diffuser (again) and the shaft housing. This is made from a length of tube with a bearing housing brazed to each end. 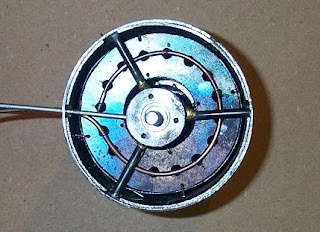 The spoked ring holds the housing centrally in the outer casing. The diffuser assembly is fastened to the front of the shaft housing using three countersunk screws and holds the front bearing in place. The rear bearing is allowed to float axially (partly to allow for thermal expansion). Bottom row, the partially complete turbine wheel. (The blades need shaping). 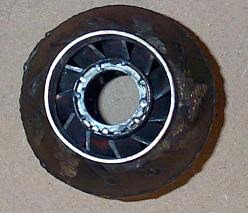 The rear turbine bearing assy. The main shaft, compressor bearing assy. and the compressor wheel. 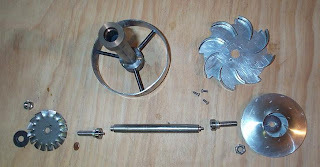 Here's a shot of the partially assembled turbine shaft. The turbine wheel is 1.8mm stainless, sawn to a circle, the blades slotted and then each twisted to 37.5 degrees. The outer casing is constructed from stainless steel pipe, 100mm diameter. But the turbine end is 64mm diameter pipe, So the casing needs to come down from 100mm dia to 64mm with a taper section. 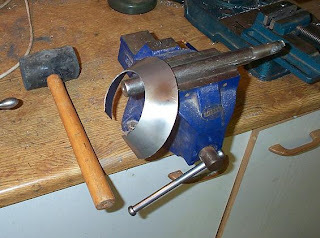 I hacksawed a sector out of steel plate (1.6mm ss), which took quite a while and left me dripping sweat. Then I spent ages more gently pounding it over a steel bar with a rubber hammer. I'm pretty proud of the result - a truncated cone that neatly joins the two cylindrical sections. It will have to be welded, This part is likely to get too hot for brazing. The idea of the turbine casing coming adrift at speed doesn't bear thinking about. It will be bolted to the casing. All of the dimensions were dictated by the size of the compressor wheel and housing and the available sizes of pipe I had in the workshop but it all worked out quite neatly in the end. There's still a lot of work to be done. 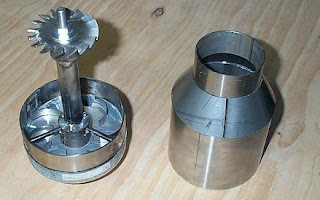 The turbine needs a set of stationary vanes too (mounted in the conical section of the casing) to increase efficiency. Those turbine blades need to be shaped to an airfoil section and the wheel balanced. Welding up the outer casing was a mistake. More haste : less speed. I should have put in the rear stator blades first. There's a bit of confusion over what to call this bit. 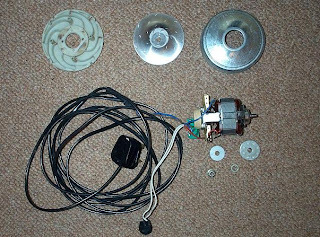 Its a stator assembly really, sometimes (wrongly) called the diffuser which confuses with the compressor diffuser. Most people seem to settle on Nozzle Guide Vane assembly (NGV). These blades impart a rotation to the exhaust gas flow just before the gas strikes the turbine blades, which just about doubles the efficency of the turbine. The rotation is 'taken out' by the turbine with the result that the exhaust gasses exit pretty well straight out of the back end. 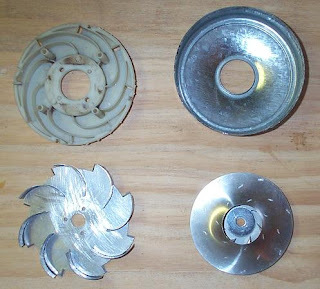 stator blades can be curved too. Then they must be inserted precisely enough to provide an accurate location for the turbine shaft. On the whole, a tediously fiddly job that would have been easier if I hadn't made access almost impossible beforehand. The inner end of the stator blades form a ring that locates the tube that in turn supports the back end of the turbine shaft. I hadn't the faintest idea how to make a combustion chamber. But apparently, because of the high temperature of the burning fuel, most of the air that comes into the engine is used for cooling so that the turbine blades don't melt. Everything I found on the subject suggested that about 20% of the air is used for direct combustion, another 20% is used also in combustion but also to help stabilise the flame towards the front of the chamber (by creating a vortex). The rest of the air flows around the outside of the chamber and is introduced gradually into the hot gasses. So my design was for an annular chamber, consisting of a ring and two tubes (inner and outer). The whole thing is just stitched together with pieces of stainless steel wire. The annular ring is pierced by 16 holes (6mm dia). Propane is injected into these holes from a 'gas ring' placed just in front. 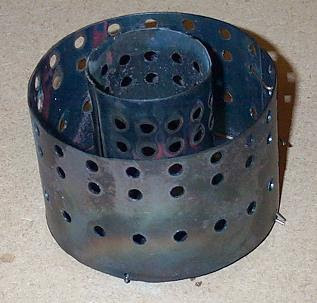 The gas ring is just a ss tube, bent into a circle and pierced at 16 points to coincide with the holes in the ring. The tube is held in place by stainless steel wire, hooked into the ring holes. The other (straight )tube visible just above the gas ring in the picture is the oil feed to the turbine shaft. About 20mm along the inner and outer tubes is another series of holes. These are intended to inject air sideways into the flames, hopefully imparting turbulence and ensuring that all the available fuel is burned within that region. At the exit end of the chamber there are more holes to allow the remaining air to enter the chamber, providing cooling. Before mounting the chamber in the turbine, I tried some static tests, blowing air into the chamber which was mounted in a tube. When gas was added and ignited, it did seem to burn as expected, but there is no way to be absolutely sure how it will work in practice. my name is miguel can you tell please what is the name of the vacum where did you bought it ?Also when are you going to put more information about the turbine that you are building , how to make the other parts that are nessesary to finish the turbine because I will like to learn too , I don't have to much experience , but i will love to build my owen turbine like your. The Vacuum cleaner was a bad idea. It didn't work. Building this engine is much more difficult than it looks from just reading books. how are you doing Anthony ? thank you to let know that the vacuum was a bad idea . please keep posting for new development that way I can learn my self of new improvement you do. Anthony where do you live ? Me I am from Italy living in Florida - USA..
You have an amazing blog there. Do you mind if I print it? Would love to have a hard copy handy. Reading your stuff found about something that was really "bugging" me, ratio between compressor size and turbine. Any good book you would recommend? Printing is fine, go ahead! "Model Jet Engines (Modeller's World)" by Thomas Kamps; is probably the best. Both books are difficult to follow - the math is not very clearly explained. Best source of information is the Yahoo group for Jet turbines - mostly converted turbochargers but very helpful advice from the regulars. can you tell me what did you use for fuel injection and what fuel did you use? can you please provide your email ID?